Description: An eastbound freight passes through Grand Crossing. Description: An eastbound approaches Grand Crossing at dusk. Description: On a rainy afternoon, train 261 has started up from the signal at CP Adrian and is once again headed toward Buffalo. Track 1, on the left, is out of service and will shortly be removed. Description: 261 is out of E Binghamton yard and will attain the Southern Tier Line here at BD, starting its trip to Buffalo, and a long chase for me. Ill follow this train to Portageville. 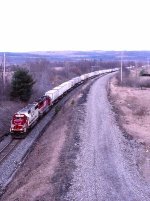 Description: One of the locations that has a really good view, and I wish Id shot here more often, except that youre on the NY 70 overpass, is here at Canaseraga. The Erie main tracks were separated here-there was once a center siding through town-and were also grade separated. Whe Conrail single tracked here in 1992, track 2, not so jokingly referred to as the "D&H Main" due to its 10 MPH speed restriction, was the track that got lifted, leaving track 1, now a 50 MPH speedway. Train 261 is taking advantage of the improved conditions as it makes its way toward Buffalo. Description: The Chenango River is running high as train 261 crosses the bridge behind SOO 6012 and 6042 with 95 cars of TOFC. The building to the right of the photo, the Derby Knitting Mills, burned to the ground in a general alarm fire in 2011. Description: The Southern Tier Line ran past a rock outcropping just as it was coming into Endwell, always a good spot. The pole line is pretty impressive as well. 261 goes west here. Description: This was taken from the access road to Letchworth State Park-you can drive right by the gate in the off season-showing the road overpass as well as the main bridge. At the time, it was the highest bridge on the Conrail system. It is not so now that NS owns it; they have at least one on the Rathole that is 300 feet. Description: Train 261 rolls past the crossing at Wellsburg. Theres still snow on the roadside. Winter doesnt give up easily in the Tier. Description: CP Rail X502 heads east past Harrison Raod behind a matched pair of Soo Line Candy Apple Red SD60s. Description: SOO 6050 and sister candy apple SD60 lead CP X502 east near the 131 overpass. Description: A big surprise on UP Train GLRBAM 28 was this SOO Line and CP Power. Pretty nifty train. This was the 4th SOO Unit I've ever seen around here. 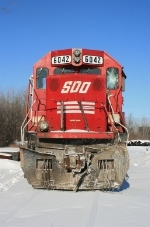 Description: A pair of SD60s idle beside a pair of AC44s under the racks. Description: SOO 6042 waits for a crew at CP's Pigs Eye yard. Title: 070904146 Eastbound CP freight passes BNSF Midway Yard on BNSF Midway Sub. detouring because of track project at Park Junction on St. Paul Sub. Title: 070904148 Eastbound CP freight passing BNSF Midway Yard on Midway Sub. detouring because of track project at Park Junction on St. Paul Sub. while westbound BNSF freight waits to use crossover. 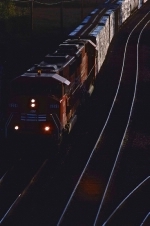 Description: Victim of Friday's train (#288) vs semi in Winona. Soo #6042 was the leader when it hit a semi trailor carrying plastic pellets. Description: Bent metal, a smashed window, railings torn and mangled, plastic wrap from the truck trailer adorn the #6042 - the crew wasn't hurt thankfully!